It is important to clean your patio or block paved driveway on a regular basis. High pressure steam cleaning can help remove all types of weeds, dirt and algae that build-up over long periods of time. Unlike many other pressure washing companies in Nottingham, we do not use commercial “mechanical sweepers”, as these can destabilise the brickwork, leading to extensive and costly repairs in the long run. If you would like to inject some fresh life into your driveway and make your block paving look like new, our high pressure steam cleaning services can restore the surface in question. 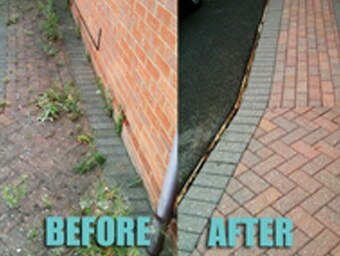 Get your patio or block paving looking like new again with a professional clean from AquaBlast. We use a high pressure steam cleaning method to remove all types of weeds, dirt and algae without destabilizing the brickwork. Other types of cleaning can lead to extensive and costly repairs in the future, but our system restores your surface gently. Weeds, dirt and algae build up over long periods of time, making your patio or block paving look tired and dated. It is advisable to have it cleaned on a regular basis to keep it looking new and to protect against long-term staining and damage. In many cases, our patio and block paving cleaning can restore a surface that you may have thought needed replacing – saving you a lot of time and inconvenience. For added protection, we can also apply a specialist block paving sealant, keeping your patio or driveway looking new for even longer.